Worcestershire’s Tom Kohler-Cadmore was the winner of the Walter Lawrence Trophy in 2016, scoring a 43-ball century. 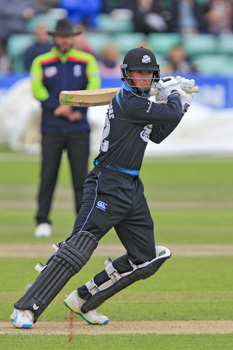 The 22-year-old smashed 5 sixes and 13 fours in his century, helping to post an unassailable total of 225 for 6 for Worcestershire Rapids in their 38-run victory over Durham Jets at New Road on May 20. The opener, nicknamed ‘Pepsi’, went on to score 127 from 54 balls, including 8 sixes and 14 fours, the highest score for the county in 14 years of T20 cricket. An outstanding schoolboy cricketer, the Chatham-born Kohler-Cadmore won a cricket scholarship to Malvern College, where he amassed three scores over 150 and averaged over 100 in his last year. He was named Wisden schools cricketer of the year in 2014 before joining Worcestershire and scoring 47 against Bangladesh A on his debut.